KLICKITAT The leaves have definitely been dropping here on the south flank of Mount Adams. Fall colors, while some brilliant a week ago are less so today. 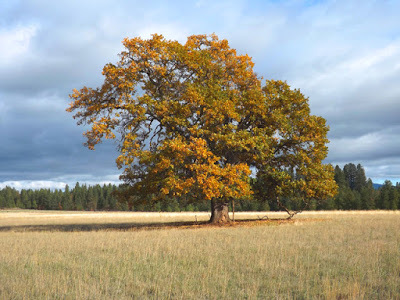 Interestingly, not only does the region have brilliant Fall colors from the Birch, Aspen, Cottonwood and Maple but it also sports a ‘pastel’ tone from the changing colors of the ‘Oregon Scrub Oak’. Not to sound like a broken record but the fishing has been good. Some days better then others. 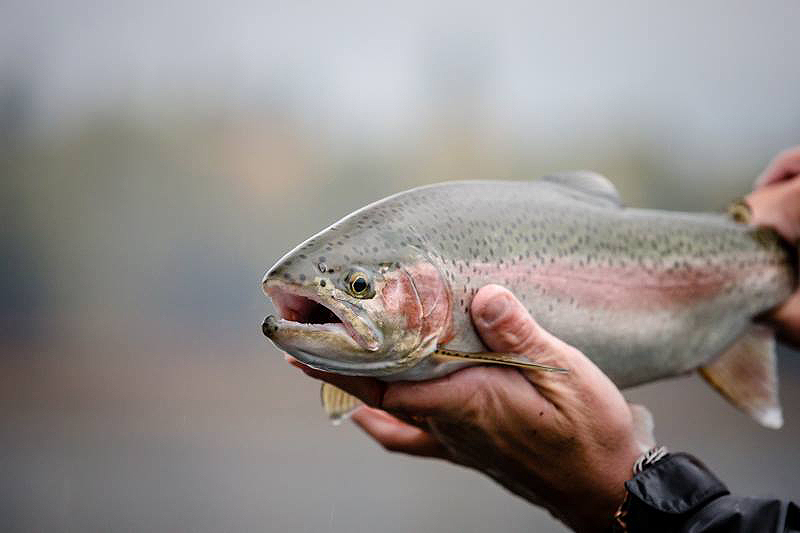 The past 2 weeks showed off some big wild fish….up to 18 pounds. 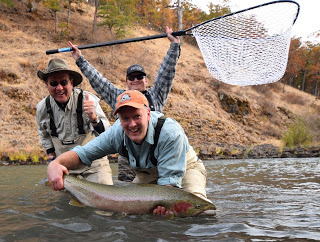 I would describe the swing fishing as reliable, with some magical days. Some days with goooood numbers, some days with ‘sweet comebacks’, some days with awesome toilet bowl skater takes. Probably don’t need to say more. The nymphing as per usual continues to ‘rope chrome’ as some would say. YAKIMA The best of ‘Far and Fine’ on the Yakima is the late fall. The prime time of 1-4 PM with a #18 BWO on light tippet, to rising fish, is clutch. 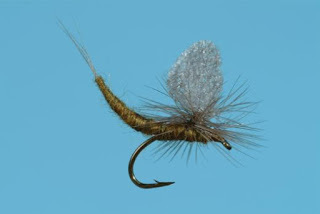 Can be a bit a bit tough for the newbie; tough to see and even more tough to present the fly drifting ‘without tension’. Aside from the far and fine tactics there still are a few fish willing to eat a # 10 October Caddis imitation, although that won’t last long. 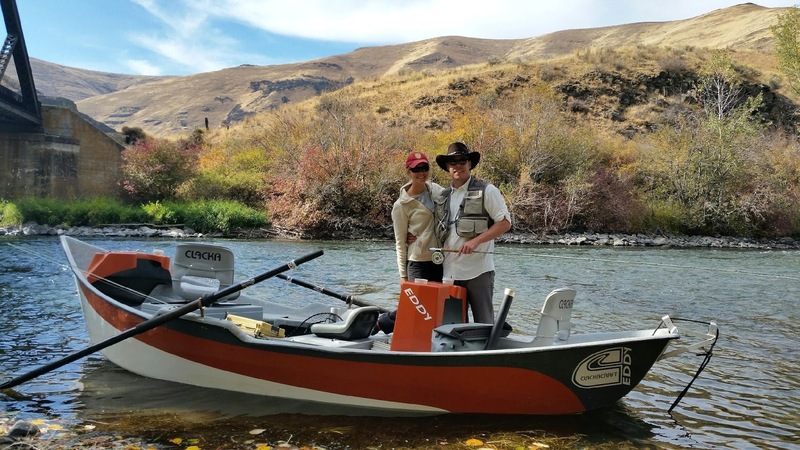 The October Caddis is nearly done for the 2015 season. Today high water temp in the Lower Canyon was 52 degrees. Pretty ‘Doggone’ warm for this time of year. The upcoming weather shows a definite cool down. Most likely our water temps will drop towards the normal 46 degree mark soon. Streamers continue to be a worthy game. Often times the streamer doesn’t bring numbers but quality. Some of the cloudy days lately have offered up some nice trout on a retrieved streamer. 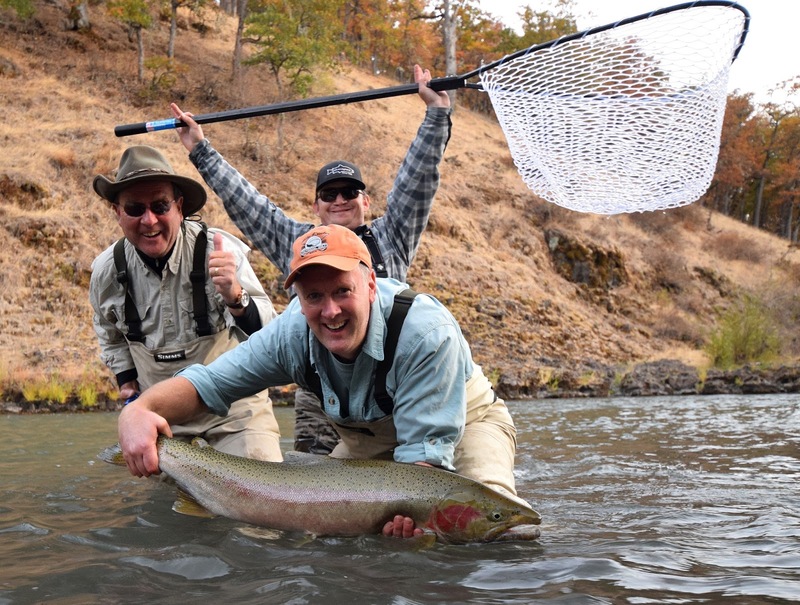 Dry fly leaders should be lengthened to at least 10 feet and a 12 footer is suggested when fishing by foot. Enjoy the Fall, it is almost over! Never hesitate to fish the soft hackle swing for the Blue Wings. Pretty much a lost art. 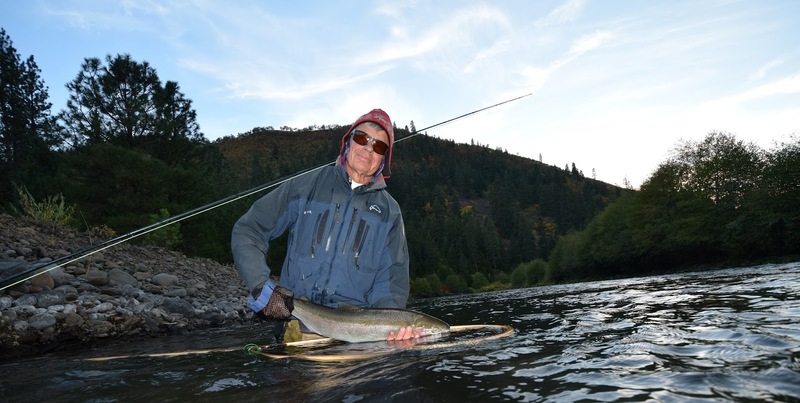 Swinging for steelhead is done everyday but for some reason swinging for trout is less popular; especially during a hatch. Overall pressure has lightened recently. Both the nymph and the swing have been productive. Clarity is at 3-3.5 feet depending on time and zone. Joe was 2 for 3 yesterday! 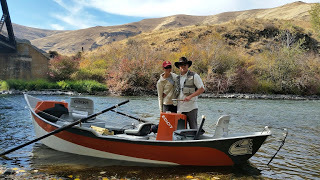 Fly of choice for Joe was a Cerise and Black Super Muddler with 10 feet of T-11. We have seen fish on dry lines and light tips recently as well. The challenge with the SKATER is for them to actually stick, when they eat it! 2 days ago we had a fish show on a big waker and it was almost a tidal wave in the fish’s effort to encounter the bug. Never felt or saw him/her again. CRAZY. 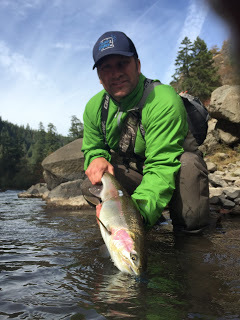 Salmon are close to be in the full on spawn mode and the Coho are starting to trickle in. 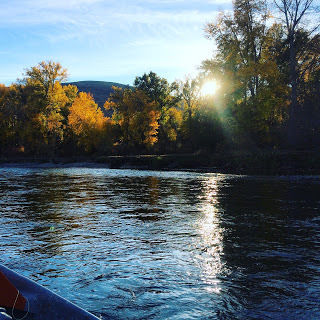 River pressure continues to be high even with the Methow and hunting season opener. There are fish through out the system; From bottom to top. Definitely back in shape with 2 – 2.5 feet of vis depending on time and zone. Currently Blown Out….Will keep you updated. 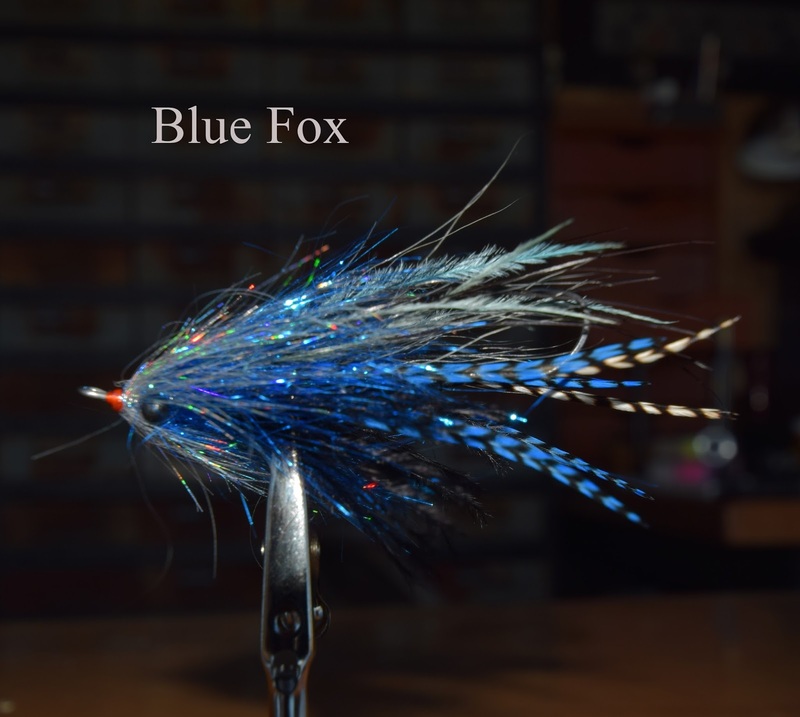 The best searcher pattern lately for the Blue Wing and Mohagany Duns is the #16 Parachute Adams. Remarkable, isn’t it – a generic pattern that is tried and true. 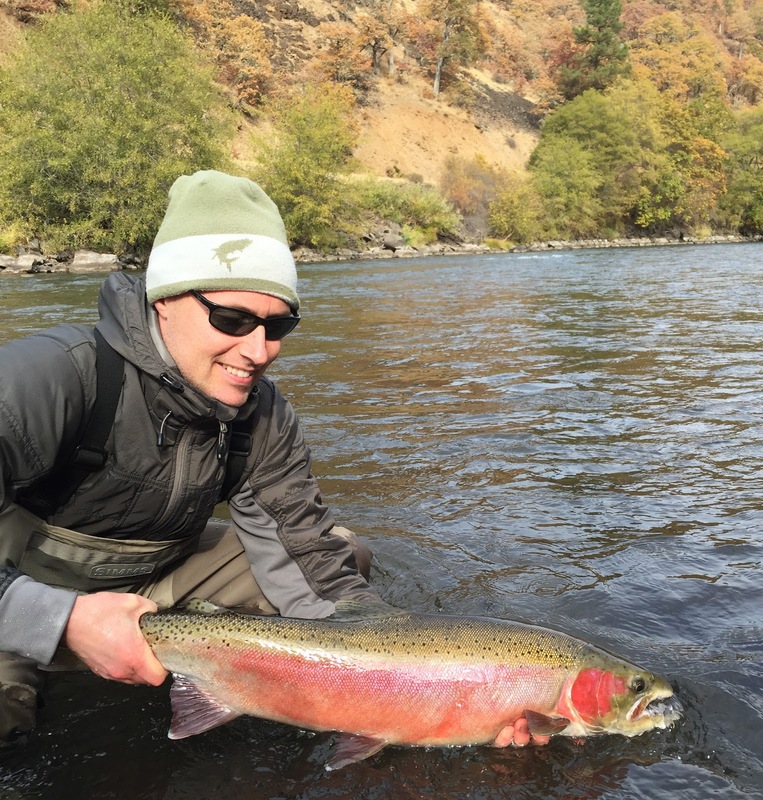 Other wise the best of the Fall bugs continues to make for some great fishing. KLICKITAT RIVER – Sporadic is the word. Some days are spot on for the Steelies, and some days not. Hard to predict. Lot’s of Chinook in the river that are being targeted as well. The river is flowing at 585CFS. The 40 year average is 740CFS. We are obviously below average, but not bad. The river has seen incredible pressure lately. Fall colors are in close to full glory. The last hour has been magical with the swung fly. Everything from small muddlers on top to light tips and Little Pocket Picker’s have produced. Clarity is at 4.5 feet and the water temp has cooled recently with some cold nights. Rick Matsen with a sweet hen from yesterday. 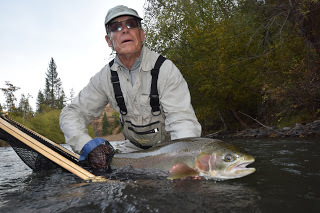 Upper Columbia Bow from today – Bryan Gregson photo.